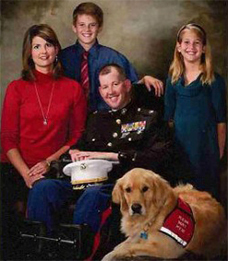 At the age of 39, Marine Lt. Col. Ty was struck by a sniper’s bullet directed from a mountainside in Afghanistan. As he was lying on the roadside, all he could think of was death and love for his family. While he would survive, the bullet wreaked havoc inside his brain leaving him unable to speak and totally paralyzed. Through years of grueling therapy, he would regain his speech and partial use of his left hand and leg. 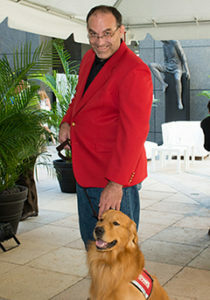 Later, Colonel Edwards would become the first recipient of a Golden PAWS trained service dog. Colonel Edwards has fought tirelessly to regain his strength and independence. Cody has been by Ty’s side during countless hours of speech therapy and grueling physical therapy. Cody Bear now helps his friend by opening cabinets, flipping light switches, picking up the telephone, and with countless other small tasks that have helped Ty regain his independence. With the confidence that Cody has brought him, Ty completed a 5K wheelchair race, with Cody by his side the whole way. 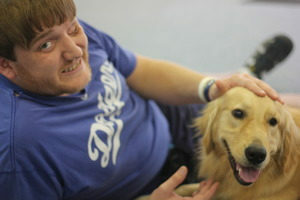 Says Ty about his Golden PAWS service dog and partner: “I didn’t realize what a difference he would make in my life”. Christian is a Marine who served our country in Kuwait during the first Gulf War. During his last deployment he suffered a traumatic brain hemorrhage and injury. After a yearlong coma, a three year struggle to learn to speak again and eight years to learn to walk again, Christian’s main goal is to live as autonomously as possible. 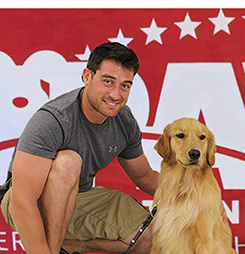 Golden PAWS Assistance Dogs recognized that a service dog would help Christian meet that goal and partnered him with Ivan, one of our most highly skilled physical assistance dogs. Because of Christian’s fragile condition he is unable to travel. 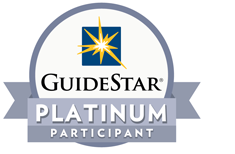 Golden PAWS stepped up and over the course of three months all team training was conducted at Christian’s home on Santa Maria Island. The bond that has formed between Christian and Ivan is profound; the assistance and support Ivan provides Christian is life-changing. 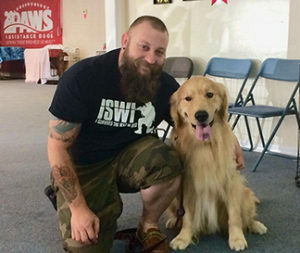 Golden PAWS continues to support Christian and Ivan with ongoing training in their environment that is so essential to their success as partners. 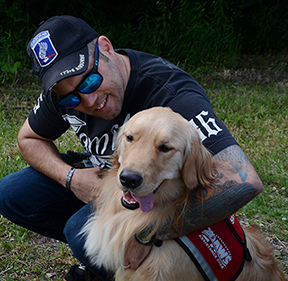 Reid is a 9 year Army veteran who served from 2006 to 2014 as a member of the 178th Airborne Division. He saw heavy combat in Afghanistan and suffered multiple injuries while deployed. 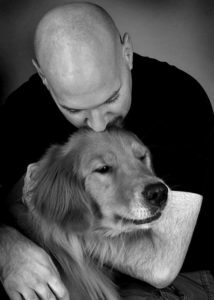 Reid struggles daily to cope with severe PTSD, mobility issues, and random episodes of excruciating pain and discomfort. Reid’s PTSD made it almost impossible to relate to our civilian society. He’d lost a sense of purpose after leaving the military. He was trapped at home thinking only about the past things he’d been through and the things that he’d done. 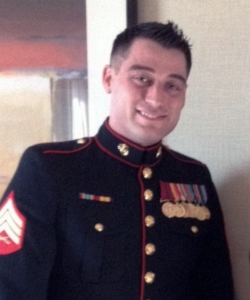 Will received a PTSD diagnosis that followed him home after his years of service as a MOS Marine. The symptoms were so severe they kept him isolated from his community, avoiding even small groups of people in public. Will is married to Nicole and they have an adopted daughter. Nicole, also a veteran, is incredibly supportive. But even though he had the incredibly strong support of his wife and love of his family the PTSD was even affecting his special relationship with them. 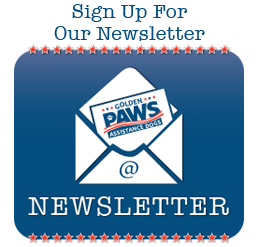 With the help of Golden PAWS dog Big Al Will has begun to relearn and trust his ability to be a part of his family, in their whole lives, not just behind closed doors. “The biggest hurdle for me to get over was to be in public with a lot of people around. Al has actually allowed me to get out more, I’ve been a part of things that normally I wouldn’t have just in the time he and I have been a team”. Kenny served in the US Air Force for 13 years in anti-terrorism units, conducting helicopter insertions against armed hostiles. His career specialty was as a radiation incidents first responder, stopping terrorists from coming into the US with dirty bombs. He didn’t realize how it all affected him until he started having flashbacks, nightmares, difficulty sleeping and feelings of guilt, depression and fear. Prescription drugs and pharmaceuticals had little impact when it came to treatment of post-traumatic stress and hopelessness seeped in. Then Kenny was introduced to Knight. Joe retired as an 18 year USAF MSGT after serving American interests all over the world including Afghanistan, Iraq, and Africa. But after his honorable discharge Joe noticed changes in himself that made it difficult to live a happy and healthy life with his family. 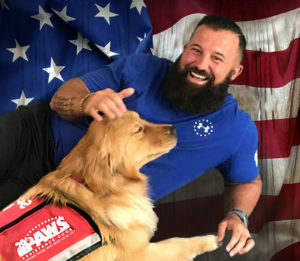 After struggling with debilitating PTSD for years he reached out for help in the form of a partnership with a Golden PAWS service dog. 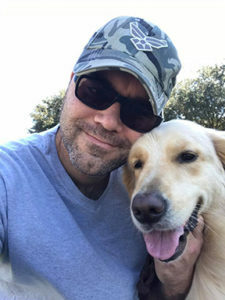 Zelda was introduced to Joe and there was such a connection that it didn’t take long for both to know Zelda was going to be his Golden PAWS canine partner. The bond Joe now holds with Zelda has transformed his life. Where he had once isolated himself, today with Zelda’s loving care and support he is integrating back into a fulfilling life and healing past traumas. thinking that I was back in the war. I was skeptical of everyone and everything and always wondering why people would just want to be around me.” Named by a group of Kindergarten students, Biscuit would make Edwin’s battle easier. “Since Biscuit has come into my life it was like a switch came on and something has changed in me…I am finally going out and talking to strangers and enjoying my conversations. 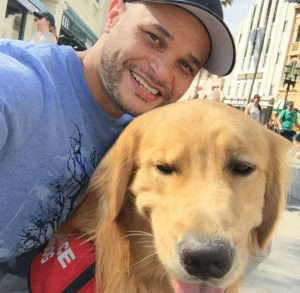 Biscuit has given me the confidence to live the life I always dreamed of.” Shortly after receiving Biscuit, Edwin found the strength and courage to complete the transition from military life to civilian life. Now a graduate of the International Academy of Design and Technology and Full Sail University, Edwin is traveling the world with Biscuit by his side as he prepares to launch a new career in his chosen field. Married with three children Reno has struggled to deal with the effects of his physical combat-related injuries. 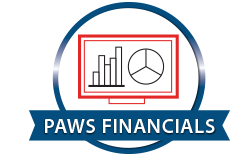 He and his family also recognized his need to heal from the extreme PTSD symptoms that afflicted him and looked to Golden PAWS for help. Duke’s size and strength make him a perfect match for Reno’s need for stability and mobility assistance. 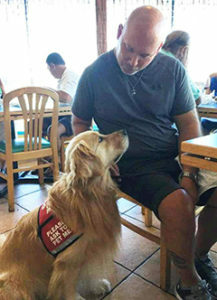 Duke is also providing the emotional support Reno was searching for; a friend that is helping him work through his anxiety, anger and depression issues allowing him to reconnect with his family.